There are plenty of ways to lose money in this world, so it’s important to know if and how your money is protected against losses. Since the financial crisis, two main concerns are losing money to a company going bankrupt, and losing money in the markets. Fortunately, if a firm holding your money goes belly-up, you’re often (but not always) protected – at least to some degree. So the odds of watching 100% of your account balance disappear are relatively low. For example, when Washington Mutual Bank failed in 2008 – the largest bank failure to date – customers did not lose money thanks to FDIC insurance. Banks and credit unions are generally very safe places to keep money. You’re not exposed to market fluctuations, and most institutions are insured with backing from the US government – if the government can’t help, you’ve got bigger problems than your money. Sometimes banks fail. The investments they make don’t work out, and they no longer have the funds to meet customer demands. If word gets out and there’s a run on the bank, things fall apart even faster. Fortunately, most banks get bought by other banks (customers of the failing bank become customers of the buying bank), and usually nobody loses any money. In many cases, customers hardly notice when a bank fails. To ensure that your funds are as safe as possible, verify that your money is FDIC insured. If you use a credit union, your money is just as safe as long as it’s a federally insured credit union using NCUSIF insurance. Remember to keep your balances below the limits ($250,000 per depositor per institution) to limit your risk. Retirement accounts in banks and credit unions are insured just like any other account. Your accounts might be combined when looking at the $250,000 limit, so don’t assume each account gets its own limit (your Traditional IRA and a SIMPLE plan may be combined, for example). Depending on how your accounts are structured, you might be able to get more than $250,000 covered at one bank, but you’ll want to verify that with the FDIC. If your money is held with firms that do not offer FDIC or NCUSIF protection, you might still be protected. Many investment account offer Securities Investor Protection Corporation (SIPC) coverage. This coverage only protects you if your brokerage firm fails – it does not protect you against market losses (if your securities lose value in a market crash, for example) or bad advice. SIPC coverage is good for up to $500,000 per account type (only $250,000 of that may be held in cash). For more details, visit the SIPC website. If you’re like many, your largest investment asset is in your employer’s retirement plan (such as a 401k or 403b plan). To find out about your protection, start by checking to see if your account is insured by the FDIC insurance – which isn’t likely – or covered by SIPC. What if your employer goes bankrupt? Most retirement plan assets aren’t held by your employer – they’re often in a special trust that the employer cannot withdraw from. However, if your employer falls on hard times, it’s a good idea to monitor your accounts: make sure that no withdrawals are being made, and that your contributions actually go into the plan every pay period. If you participate in a nonqualified plan (like a 457f or top-hat plan), you could very well lose money if your employer goes bankrupt. Those assets are considered assets of your employer and might be available to creditors. What if your 401k loses money in a market crash – can you insure against that? Generally, no. 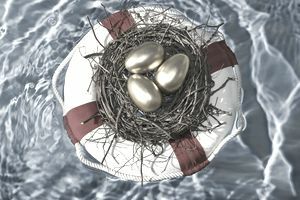 Most 401k plans are not FDIC insured (some plans offer one or two investment options within the plan that are FDIC insured – but most investment options are not insured). Some employer plans offer products from insurance companies that might help you in a market crash, but don’t get your hopes up. Insurance protection (often in the form of an annuity) for 401k balances is not something the majority of employers offer. Those guarantees are only as strong as the insurance company making the guarantee, so you’re counting on the financial strength of that company (there’s no US government backing, in other words). What’s more, that protection comes with extra fees, expenses, and restrictions, so you’ll want to read through disclosures carefully before you start using it. Ultimately, the closest thing you can get to a sure thing is a deposit (under the limits) in an FDIC insured bank account or NCUSIF insured credit union. The catch is that over long periods of time, inflation can affect your savings.